Four times as many illegal infiltrators left Israel voluntarily in 2013 than in 2012, statistics show. The number of illegal infiltrators from Sudan and Eritrea who voluntarily left Israel this past year stands at 1,850, according to statistics released Thursday night. This figure is four times the number of illegal aliens who left voluntarily in 2012, said the Population and Immigration Authority. It attributed the increase to the new amendment to the infiltrators’ law, as well as to the increase in the financial incentive given to illegal aliens who leave of their own accord, which now stands at $3,500. Last year, Israel launched an operation dubbed “Going Home”, which combines a police crackdown with financial incentives for illegal infiltrators who leave by choice. 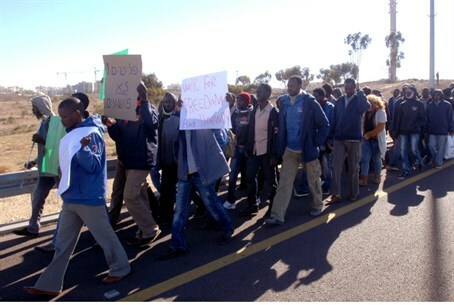 Infiltration from Africa has been a major problem for Israel over the past several years, as tens of thousands have entered Israel trying to find work and have settled in working class neighborhoods in southern Tel Aviv, Eilat and many other cities. Residents of these neighborhoods have been suffering from endless harassment, fear and violence perpetrated by the many illegal infiltrators. Israel has been fighting the illegal infiltration by building a security fence along the border with Egypt, a fact which has helped in stopping the endless flow of infiltrators. The problem, however, remains with the illegal infiltrators who are still in Israel. The United Nations has stated that they cannot be sent back to Eritrea, saying the situation in that country is too dangerous. Israel recently approved an amendment to the law to prevent infiltration of illegal immigrants, which allows police to jail illegal migrants for up to 12 months in special detention facilities. In response, some 200 illegal entrants to Israel ran away from the special open facility in Holot in southern Israel and protested in Jerusalem. Protesters said the open facility, which they must return to each night, is essentially a prison. Many accused the government of racism. The illegal entrants argued that they should be given refugee status. Those illegal entrants who Israeli authorities recognize as refugees are allowed to work in the country and are eligible for benefits, but authorities argue that the majority are simply economic migrants and not eligible for refugee status. Prime Minister Binyamin Netanyahu has said that, despite the protest march, Israel would deport the illegal aliens. "Illegal migrants cannot be allowed to take the law into their own hands," Netanyahu stated. "We will enforce the law and we will deport them according to law."